Activists had planned to continue daily protests until March 26, the deadline for Kinder Morgan to finish clearing trees in the area before migratory birds begin nesting. Dozens of Indigenous youth and other demonstrators gathered at Kinder Morgan's Burnaby Terminal over the weekend, in the latest in a string of protests against the expansion of the Trans Mountain pipeline. Protect the Inlet spokeswoman Virginia Cleaveland said 58 protesters had been arrested by early Saturday evening, bringing the week's total to 173 arrests. Those arrests included Green Party Leader Elizabeth May and local New Democrat MP Kennedy Stewart. Protesters are prohibited by a court injunction from entering within five metres of two Kinder Morgan terminals in Burnaby. In a statement released Friday, Trans Mountain said preparatory work for the project at Kinder Morgan's Westridge Marine and Burnaby terminals was now complete, but crews are still at the sites doing clean-up work such as removing salvageable timber and waste wood. It also said it respects the right to peacefully protest "in a safe and lawful manner." 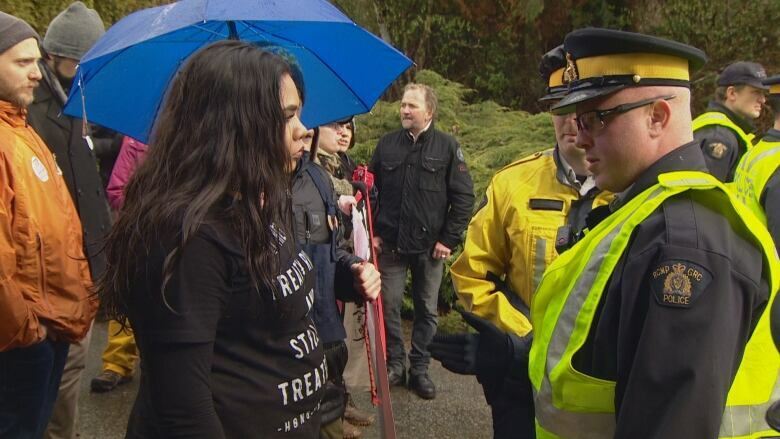 "We're taking a stand against the Kinder Morgan pipeline, we're standing up against bullies. Justin Trudeau can't do his job by securing the safety of our future, so we'll do it for him," George-Parker said in an interview at the site. Ocean Hyland, who's also from the Tsleil-Waututh First Nation, said youth in the community have learned about the value of the land and water from their elders. "They teach us the ways to take care of the land and carry on the traditions of our people," she said. "We're at the stage now where we're thinking about those future generations and how we're going to carry on those teachings and carry through those ceremonies to protect the land we're here on today." The musicians, who are in Vancouver for the Juno Awards Sunday night, could not be reached for comment. But in a video posted to Greenpeace Canada's Facebook page, Harmer said the project "needs to be turned back and stopped." The Trans Mountain pipeline expansion project would triple the flow of oil products from Alberta to the B.C. coast. The federal government approved the expansion in 2016, but the project continues to face significant opposition in B.C. Earlier this month, Trans Mountain began removing brush and trees at its Westridge Marine and Burnaby Terminals to prepare for future work. That includes the construction of the Burnaby Mountain tunnel portal entry at Westridge Marine Terminal, and the construction of an expanded permanent fence line on existing Trans Mountain property at the Burnaby Terminal, according to the company.